Schumann's Violin Sonatas are not among his most famous chamber works, but they certainly deserve to be. Given the consistent quality of the three, the neglect, particularly of the Third, which was only published in the 1950s, is astonishing. They all date from the early 1850s, one of Schumann's most productive periods, and the speed of their composition is reflected in the breadth of their melodic lines and in the regular moments of comfort between the more emotionally turbulent episodes. Alberto Bologni and Guiseppe Bruno have the measure of these works. Their performances are engaging, varied and above all enjoyable. Bologni is at his best when he is performing those long, flowing melodies, and the opening of the First Sonata is a great example. Bruno is a modest accompanist; there is never any danger of his overpowering the soloist. That is just as well, as Schumann takes a fairly traditional approach to the relationship between the instruments, and the piano is very much the accompanist. If I have a complaint about the performance, it is that there is an occasional lack of gravitas. There are a number of passages, the third movement of the First Sonata, for example, where the piano texture is dominated by very low notes and the violin also performs at the lower end of its range. Schumann is clearly looking for some menace here, some dark tones and some brooding, passionate playing. But that's not what we get. Both performers, and Bologni in particular, seem content to continue in the light, lyrical vein of the Sonata's opening theme. The fourth movement of the Second Sonata is another case in point. Again we have a melody that hovers around the G string of the violin and is accompanied by the piano in the lower register, but the lightness with which the main theme is played seems incongruous. For all that, there is plenty of variety in Bologni's playing, and he is certainly able to articulate the structure of these, often very long, movements through subtle dynamic shading. And while these are very much Romantic readings, there is an impressive discipline about the violin playing. Bologni resists the continual temptations that Schumann puts in front of him to overindulge in vibrato or rubato, and the clarity of line that results serves the music well. The sound quality is less impressive. Both instruments are clear enough, but neither is presented at its best. There is a curious boxy quality to the violin sound, and I'm sure that it is not Bologni himself who is at fault. It is a real shame, because he is clearly a player who takes pride in the elegance of his tone. And the piano sounds very distant, with the textures of the accompaniment often indistinct. Perhaps the microphones have been set back in order to facilitate a better balance between the two players. If so, I'd rather they had organised that in the control room rather than the studio. None of these are big complaints though. The disc is retailing at mid price, and as such this a competitive offer. 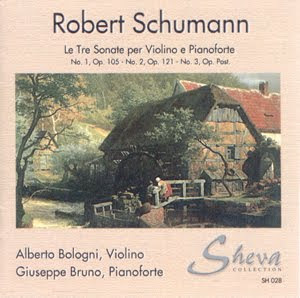 Schumann is many things to many people, but to Bologni his primarily a melodist. If you agree, then this recording might be well worth considering. On the other hand, if you're looking for some dark clouds and emotional turmoil, the full-price offerings from Gringolts, Widman or Isabella Faust may be better options.